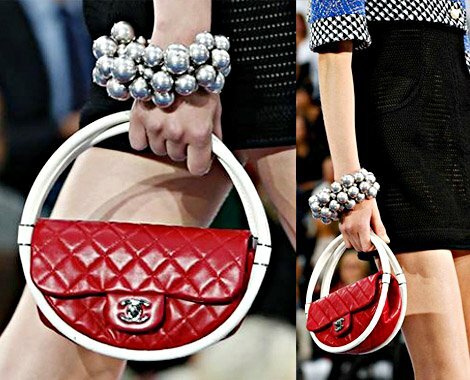 Chanel Hula Hoop bag was the most talked-about item on the fashion house spring/summer 2013 catwalk creating a huge social media buzz when it was unveiled at the Grand Palais at Paris Fashion Week in October. Baffled fashion critics declared it completely ridiculous and unusable but Chanel supremo Karl Lagerfeld wasn’t fazed: “It’s for the beach!” he said, hoping to explain away its bonkers design. And although the full size bag isn’t actually going on sale, thanks to the hoopla that the hula hoop arm candy caused a smaller version of the design is going to be made will be available next spring. Measuring 24 centimetres across, the mini hula hoop bag could be all yours for $2,400. It incorporates the trademark quilted design as well as brand new hooped handle details. “You need space for the beach towel and then you can put it into the sand and hang things on it,” Karl Lagerfeld explained of the larger catwalk version. No word from Chanel yet on what you can fit in to the baby bag. But the new design from the fashion house is bound to be spotted on the arms of the most fashion forward A-listers when it hits stores. Avid fans of the French label include Keira Knightley, Blake Lively and Jennifer Lopez, who took up a front row seat alongside daughter Emme at the spring/summer show.